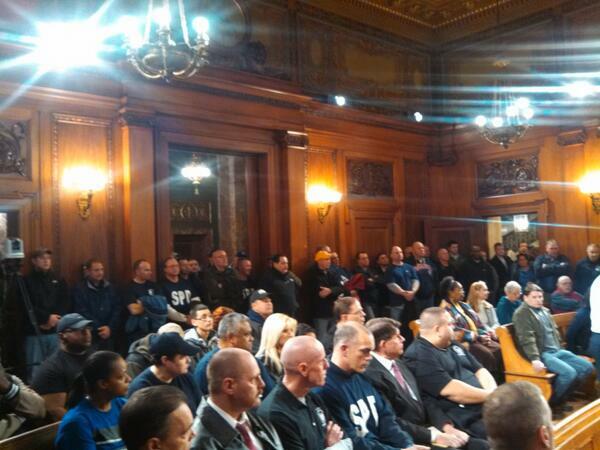 SPRINGFIELD—In a victory for organized labor, the City Council unanimously approved an arbitration award, securing a contract between the city and it’s the International Brother Hood of Police Officers, Local 364 through July 2016. Despite fears that the mayor’s office was maneuvering to kill the award and some councilors’ concerns, the meeting’s tone favored a union win almost from the start. Councilor Kateri Walsh was out of state and Councilor E. Henry Twiggs was absent due to illness. Despite the poetic justice of appearing on the same agenda as the Police Contract, the proposed Police Commission ordinance was delayed again Monday night. Due to the absences, at-large Councilor Bud Williams withdrew the item. Both councilors’ votes could be crucial to advancing the legislation. While the Police Commission ordinance did not advance, its influence was felt amid the politics of the police arbitration award. Some feared the award could split the coalition backing the Commission. Much of the agenda consisted of items that enjoyed either zero opposition or a reprieve from rising eyebrows among councilors. The monthly revenue and expenditure report, utility reports and Fire Department and Women’s Commission donations were accepted without debate. Fogarty said the state will award the grant in June, but first the city’s must approve its match to complete the application. The city’s share is 29,000, about 1/3 of the cost. If the other 2/3 is awarded it will fund a study for the new branch, possibly in Nathan Bill Park. Supporters of the project included former councilor Bill Foley and Ward 7 Councilor Tim Allen, who represents East Forest Park. Allen has touted his work for the city’s libraries as a candidate for state senate. The Council green-lighted a series of deed transfers to the conservation commission for unusable properties and bond authorizations for already approved projects like Boston Road and Central High School. Final step was also granted to changes to the School Building Committee’s membership. There was some debate over the purchase of the former Mt. Carmel School Building. The sale price in a 2010 lease/purchase agreement exceeded its assessed value, requiring it be obtained via eminent domain. Councilors had contested the price and apparent windfall to the Roman Catholic Diocese. But after some back and forth, Councilors approved the appropriation and eminent domain orders unanimously. Assurances that federal and not city dollars were being used apparently quelled dissent. The police contract was the marquee event. Seemingly every off-duty city cop packed the Council chamber, a sea of IBPO shirts, partially covered by winter coat, spilling into the anteroom. Last week, Local 364 issued a call to arms to fellow unions. Leaders from the Springfield Education Association, the Teamsters and the United Food & Commercial Workers were on hand to speak in favor of the award. As the meeting opened, there were fears the award could fail because cruiser cameras were not included. Community leaders like Springfield NAACP head Rev. Talbert Swan II had panned the award and exchanged letters with patrolmen union president Joseph Gentile. Sources both inside and outside City Hall claimed Mayor Domenic Sarno was lobbying for the award’s defeat, potentially dividing the community-union bloc backing a revived Police Commission, which Sarno staunchly opposes. The mayor is obligated to back the award, but backchannel or public disapproval of awards are not uncommon. But by the end of public speak out, those fears eased considerably. Rev. Swan did not speak and instead, Bishop Timothy Baymon, also a Police Commission supporter, urged passage of the Contract. Gentile, Kevin Coyle, the union’s attorney and former City Councilor and current State Rep Angelo Puppolo spoke in favor of the proposal. Puppolo was also on hand to back the East Forest Park library, but his backing of the award was a rare, specific show of support from an elected official for organized labor. In the House, Puppolo has cosponsored some labor priorities along with former State Rep and current Boston Mayor Marty Walsh, who used to head a union himself. Gentile, speaking to the wild applause of his members, addressed the camera issue head-on, claiming that after a 2006 pilot program, the city took no serious action. Coyle said negotiations began in 2012 before the last contract expired, but ultimately the union asked for binding arbitration before the state body that can impose a contract with public safety worker subject to legislative approval. Coyle noted the three person arbitration panel, which has one labor, one management and one neutral member, often rules on these awards on 2-1 votes. This award, Coyle said, was a rare 3-0 ruling. During the actual debate, HR/Labor Relations Director Bill Mahoney offered his take on negotiations, but claimed the city had not dropped the ball on cameras. Mahoney did take responsibility for dropping residency from arbitration. Often criticized for being a non-resident himself, Mahoney said he based the decision on arbitration rulings in 1990 and 1997 in which the city lost on residency completely. If Baymon’s support for the award were not enough, it quickly became clear that even among the Council’s Police Commission skeptics there was ample support for the arbiters’ award. One after another, councilors offered support for the arbitration process even as they were uneasy about the lack of progress on cruiser cameras. Ward 3 Councilor Melvin Edwards, okay with the award’s financial components, asked Mahoney if rejections of awards are uncommon, to which Mahoney did not answer directly. He did tell Edwards that the award, while having no force and effect, likely would be the basis of new negotiations. While not specifically condemned by administration officials, community leaders or councilors, Ward 6 Councilor Ken Shea noted the Quinn Bill in the arbiters’ award which required the city to continue to paying the commonwealth’s defunded share of program. “We need to impress upon the state to fund the requirements it imposes,” Shea said as he announced his support for the award. Williams squawked a little bit about the lack of residency, suggesting the city could trade away something like mandatory drug test for residency, but he also said he would support the award. Ward 8 Councilor Orlando Ramos, a former member of the Carpenters’ union, said he was disappointed so many city employees were working without a contract. “This never should have gone into arbitration,” he said, expressings frustration the council has no role in negotiations. He added that police issues take up a great deal of the Law Department time and the city’s treasury. Ramos pressed for assurances that the camera committee the award institutes would be established quickly and make recommendations ahead of 2016’s negotiations. Coyle told Ramos that there are big issues that the committee needs to resolve like wiretap laws, constitutional rights (for residents being recorded) and training, but both Coyle and Mahoney committed to appointing the committee. Almost anticlimactically, the Council approved the award on a unanimous 11-0 vote. Cheers erupted in the chamber and a brief recess was called as patrolman lined the rail in the chamber to thank councilors. 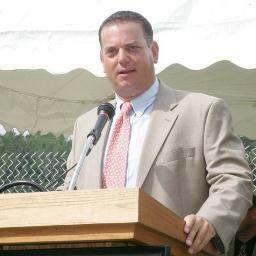 Gentile told WMassP&I later he was “very pleased” with the outcome. “We hoped to win and we are thrilled that we got a unanimous vote,” he continued. But after the meeting started up again the Council grew serious as it debated a resolution calling on the mayor to delay the appointment of a new police commissioner until the Council can act “with finality” on reforms to the Police Department’s leadership structure. “It is critical that the mayor open up the selection process,” at-large Councilor Justin Hurst said introducing the resolve. Sarno had announced that Police Commission William Fitchet’s successor would be chosen among only the city’s three deputy chiefs, John Barbieri, William Cochrane and Robert McFarlin. He said he would meet with the three deputies privately and then make his selection. Those meetings began this week and some believe he could make his selection quickly. Many sources claim, not for attribution, that Sarno’s selection of McFarlin has been preordained. Councilors alluded to none of this speculation Monday night, but a clear majority favored putting the brakes on the selection process and open it up to a wider applicant pool. “If these gentlemen are as good as is being suggested, then they should be able to stand up to public scrutiny,” Edwards suggested. At-large Councilor Tom Ashe and Ward 5 Councilor Clodo Concepcion articulated opposition, insisting that local talent is best. Ashe equivocated a little, saying he agreed with some, but not all of the language. The resolve passed on a voice vote. Although, Sarno has already told The Republican he is unmoved by the resolution. The approval of the award was a major victory for labor. As alluded to during the debate, much of the city’s unionized workforce is out of contract and labor-management relations have been squirrelly over the past decade of financial distress and turmoil. The police award included 2% raises and a 1.5% additional raise in year two, which could serve as the baseline for other union negotiations. Future employee contracts are another matter all together and not likely for a few weeks or months. For the immediate future, attention now turns down the hall to the Mayor’s office. How quickly His Honor’s moves to pick the city’s top cop could ripple out and influence the fate of Police leadership and oversight in Springfield…and beyond.